The Tibetan master Vairotsana was born in the Tibetan region of Nyemo Chekar, in Tsang Province. Even at a young age he was extraordinarily intelligent and demonstrated miraculous abilities, such as being able to fly through the sky and read the minds of others. When Trisong Detsen was attempting to establish the Dharma in Tibet, he brought Vairotsana to Samye and had him train as a translator. He was ordained by Abbot Shantarakshita as one of the ‘seven testers’; the first seven Tibetans to be ordained as monks. The king sent Vairotsana and another monk, Lektrup, on the arduous journey to India, in order to study and receive Dharma transmissions. After many hardships they finally met the master Shri Simha at the forest of Tsenden Silche, offering him a mandala of gold and requesting instruction on the effortless spiritual approach (Dzogchen). Shri Simha agreed to teach them, but gave the following warning: “I can impart to you the profound key points under a seal of secrecy, but your life will be in danger under the king’s punitive laws if you do not keep this very secret. So by day you will listen to the teachings on cause and effect from other great scholars; by night I will reveal to you the spiritual teachings of direct transmission.” In this way, Shri Simha ensured that others would remain ignorant of what Vairotsana and Lektrup were really learning. At night Shri Simha wrote down the eighteen pith instructions of Dzogchen Semde (Category of Mind) on white silk, using the milk of a white goat. When he wished to reveal the text, the silk was held over a smoking fire and the letters became visible. The monk Lektrup was satisfied with what he had received and departed for the return journey to Tibet. Unfortunately he was killed on the way. However, Vairotsana was not satisfied and requested further teachings. Shri Simha therefore bestowed on him all of the empowerments and pith instructions of the sixty Tantras of Dzogchen Semde, as well as the three cycles of Dzogchen Longde (Category of Expanse). Having then travelled to the great charnel ground of Dhumagata, Vairotsana met the master Prahevajra (Garab Dorje) and received from him the ultimate lineage of the 6,400,000 verses of the Dzogchen Tantras. In some accounts, he received this transmission through a pure vision of Prahevajra, rather than having met him in person. At that point, he truly attained the supreme siddhi of the freedom that occurs simultaneously with realisation. From this transmission came a cycle known as Vairo Nyingthig (The Heart Essence of Vairotsana). Vairotsana then returned to Tibet, relying on his yogic ability of swift-footedness. 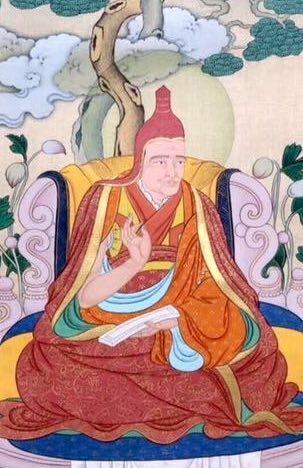 To King Trisong Detsen and others he taught the common vehicles on cause and effect by day, while by night he imparted the Dzogchen teachings to the king alone. He also translated the first five of the eighteen Tantras of Semde. At that time, envious of Vairotsana for having taken such teachings back to Tibet and in order to arouse suspicion in the Tibetans’ minds, some Indians spread the rumour that his teachings and translations were not Buddhist. Furthermore, Queen Tsepongza and a number of the king’s ministers were hostile to the Dharma and conspired to have Vairotsana exiled to Tsawa Rong (Gyarong), on the border between China and Tibet. In exile, he converted the King of Gyarong and his subjects to Buddhism and accepted Prince Yudra Nyingpo as his disciple. Yudra Nyingpo became a great scholar and highly realised Dzogchen adept, and is classed as one of the twenty-five disciples (or subjects). He travelled to Samye and met Vimalamitra, who persuaded King Trisong Detsen to end Vairotsana’s exile and invite him back to Tibet. Vairotsana also taught the Dzogchen cycles to Sangton Yeshe Lama at Taktsekhar in Tsawa Rong, to the old man Mipham Gönpo (who attained the rainbow body), to Nyak Jnanakumara in Central Tibet, and to the princess Sherab Dölma of Khotan. Finally, in the place called Bhasing in Nepal, Vairotsana passed into the rainbow body.